Three people were stabbed and 13 others were arrested when a Ku Klux Klan rally in Anaheim erupted in violence Saturday, police said. A small group of people representing the Klan had announced that it would hold a rally at Pearson Park at 1:30 p.m., police said. By 11 a.m., several dozen protesters had shown up to confront the Klan. About an hour later, several men in black garb with Confederate flag patches arrived in an SUV near the edge of the park. Fighting broke out moments after Klan members exited the vehicle. Some of the protesters could be seen kicking a man whose shirt read “Grand Dragon.” At some point, a protester collapsed on the ground bleeding, crying that he had been stabbed. A Klansman in handcuffs could be heard telling a police officer that he “stabbed him in self-defense.” Several other people were also handcuffed. Two other protesters were stabbed during the melee — one with a knife and the other with an unidentified weapon, said Sgt. Daron Wyatt of the Anaheim Police Department. Brian Levin, director of Cal State San Bernardino's Center for the Study of Hate and Extremism, said he was standing near the KKK members when several protesters attacked them with two-by-fours and other weapons. Several of the Klan members jumped in the SUV and sped off, leaving three others to “fend for themselves,” Levin said. Levin had been trying to interview the KKK ringleader, whom he identified as William Quigg, an Anaheim resident. Quigg is the leader of the Loyal White Knights in California and other Western states, a sect of the hate group that aims to raise awareness about illegal immigration, terrorism and street crime, Levin said. They see themselves as a “Klan without robes” and model themselves after David Duke, the Louisiana-based former grand wizard of the Klan, Levin said. Levin said he was standing next to Quigg when a crowd of protesters swarmed the Klan members. Levin said he pushed the Klan leader away as the violence continued and a protester was stabbed. “Thank you,” the Klan leader replied, according to Levin. A few minutes later, a crowd of about 100 people cheered when police handcuffed Quigg and one of his followers. Many people at the park demanded to know why Anaheim police did not have a larger presence before the violence broke out. Levin was also critical of the lack of a police presence. “There were no police officers here when this started happening,” he said. “It was the longest few minutes between when the SUV was attacked and when the police responded in droves,” Levin said. The Klan rally — to decry, as one of them put it, “illegal immigration and Muslims” — was initially planned for 1:30 p.m., police said. 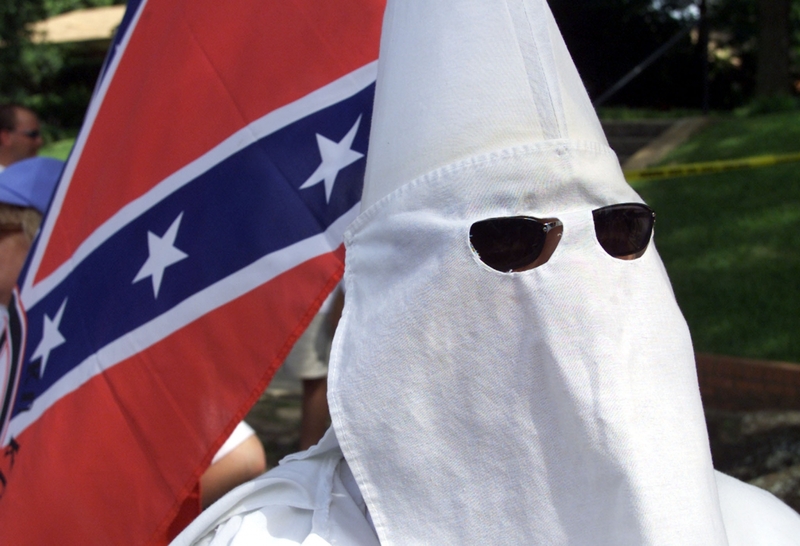 Martin Buenorostro said a friend, whom he would identify only by his nickname, “FuzzBuzz,” was wounded when one of the Klan members began using a flagpole as a weapon to fend off the crowd surrounding their vehicle. Six Klan members (five men and one woman) and seven protesters (six men and one woman) were arrested, Wyatt said. The Klan members were arrested in connection with the stabbings, he said. The protesters were arrested on charges related to physical assaults on Klan members. The stab victims were in stable condition, Wyatt said. All could face charges of assault with a deadly weapon, though Wyatt said “some people could have a self-defense claim.” He did not say if he was referring to the Klan members or the protesters. At the height of the group's power in Orange County, nearly 300 Klansmen lived in Anaheim, patrolling city streets in robes and masks. A large KKK rally once attracted 20,000 people to the city. The group's activities have been sporadic in Southern California in recent years. Last summer, at least 100 residents of Whittier and Fullerton awoke to find packets containing KKK fliers, rife with racist rhetoric, and candy in their driveways. A Santa Ana neighborhood was also blanketed with KKK fliers on Martin Luther King Jr. Day last year, police said. Anaheim, home to Disneyland and Orange County's largest city, is now more than 52% Latino and about 28% white, according to the 2010 U.S. Census.